For baby swing safety and baby bouncer function, choose a longer model. Can Be Chosen for Length. Do you sit your baby in a baby swing? A baby chair? 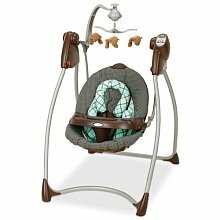 A baby bouncer seat, wire chair, soothing center, bassinet, or all of the above? The choices can be overwhelming. When it comes to just setting your baby down for some awake time, there's a huge array of new baby gear to choose from every year. What most parents don't notice, however, is that all of the assortments vary in size, and even a couple of inches makes a big difference. Baby swing safety obviously means not leaving the baby unattended, using the safety straps, and keeping the recline at an appropriate level. But it's also important to have a swing that's long enough for your baby's growing body. At just 4 months, our tall baby's head nearly hit the top reaches of the seat back. By 5 months, his feet dangled over the front. This was in one of the longest swings available, too. With that kind of body leverage, he was strong enough to wiggle and bend over the edge, even with the belt on. If we'd had an even smaller infant swing, he would have outgrown it in length by 4 months! We've hand-measured a number of the popular baby swings, so you can see which are longest, to give you the longest use possible in your choice. The longest swing seat we've found is the Graco Luvin' Hug. This brand features many different styles and colors, with different features to each, from music to vibration, but they're all the same frame size. These infant swings accommodate up to 30 pounds instead of 25. They are commonly available too. For more on all our baby swing measurements click this link. You can see if a specific baby swing you were going to choose, is shorter than some others. There are so many names for a baby chair, it's easy to get confused between products. For our purposes, we're generally talking about a wire frame baby chair that bounces or sways with the baby's kicking. This self-propelled form of entertainment, is just about the best investment you'll make, if it fits for a long time. The baby chair that bounces...or the baby bouncer...or the baby bouncer chair... or whatever you call it, will generally be the piece of baby gear you use more than any other! 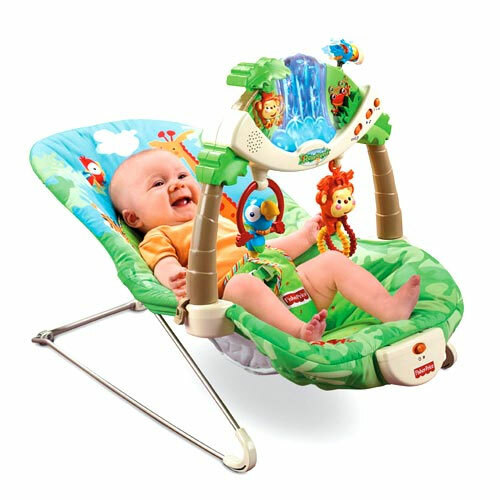 more baby bouncer brands and models we measured, and these recommendations. We'll also review two other baby chairs, the Bumbo, and the Summer 3 Stage Super Seat. These chairs don't bounce, the baby sits upright. They seem similar at first too. Sadly, the Bumbo had a short shelf life with our tall baby in terms of safety. While it seems like an ingenious design for average sized babies, a long or tall baby's feet can touch the floor in the seated position, when as young as five months. By pushing on the floor with his heels, a long baby can pop himself right out of the seat completely. Ours did. Though he liked sitting up, this pop-out ability meant we couldn't leave him for a moment, even to visit the bathroom. By 5 months of age, it was only a safe chair when sitting right next to us. The baby chair called, Summer 3 Stage Super Seat, however, includes a seat belt. It's a simple addition that means a longer baby can't pop entirely out of the chair as easily. 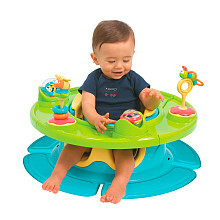 Unlike the Bumbo, the play tray comes with the chair, and encircles the entire thing. The chair turns as well. This makes the Summer 3 Stage Super Seat also like an activity center . This chair also accommodates up to toddler size too, with a 40 pound weight limit.